We have been looking at the beautiful post-synodal apostolic exhortation Catechesi Tradendae (On Catechesis in Our Time) by Pope St. John Paul II in our last several posts. Today we continue our look at this document, examining the seventh section: “How to Impart Catechesis”. We have established, in many ways and contexts, why catechesis is important. It is something that was lost for a long time, something that was downplayed or disregarded in some senses. And in places where the faith was imparted, in some cases there was no personal element; one must have a relationship with the Risen Lord, and catechesis is how this is done. You come to love someone best by truly getting to know them. The Holy Father considers the diversity of methods that are necessary in imparting catechesis. 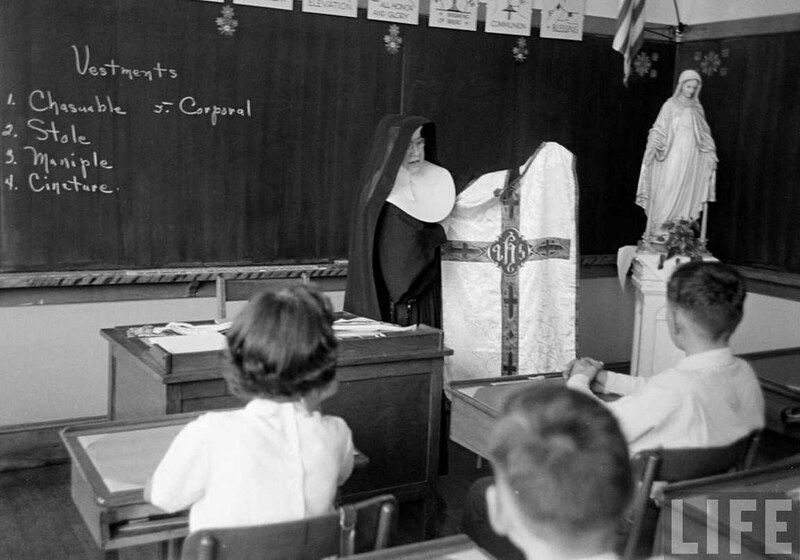 “The age and the intellectual development of Christians, their degree of ecclesial and spiritual maturity and many other personal circumstances demand that catechesis should adopt widely differing methods for the attainment of its specific aim: education in the faith.” (51) We know that it is of fundamental importance that people are catechized. We know that the faith must be imparted, that people must be evangelized so that they come to know and love God and desire to serve him. Because this is so important, we must be sure to use appropriate methods to do so. Most of the readers of this blog are catechists, DREs, Faith Formation directors, or teachers. Whether in a school, a parish, or at home, you know that pedagogical principles help you to instruct people at different ages and grade levels. This is one of the factors to be considered under diversity of methods. Catechetical series are always developed with pedagogical considerations in mind. Some achieve pedagogical appropriateness more effectively than others, but it is always a factor. There can be different approaches to the same grade level, of course, and this can even be seen in Ignatius Press’ two catechetical series: Faith and Life (www.faithandlifeseries.com) and Image of God (www.imageofgodseries.com). This is also a prime consideration in the NEW catechetical series that is being developed by Ignatius Press and the Augustine Institute: Word of Life (www.wordoflifeseries.org). We will look more at this new series in an upcoming post on this blog. Another consideration in the imparting of catechesis is the role that difference of cultures plays. Because catechesis, and evangelization in general, can be said to be called to bring the Gospel into the very heart of cultures, “catechesis will seek to know these cultures and their essential components; it will learn their most significant expressions; it will respect their particular values and riches.” (53) The faith must not be altered or diminished for the sake of inculturation; rather, the culture must be enriched by the faith. Catechesis should “help them to bring forth from their own living tradition original expressions of Christian life, celebration and thought.” (53) That being said, we must insist that the Gospel be transmitted in the context of the culture in which it originated, that of Jesus and the biblical world. The pope also considers the role that memorization can play in effective catechesis. This is a somewhat controversial question, as the pedagogical role of memorization has been fiercely debated for some time. Coming from a mainly oral tradition, as Christian catechesis does, memorization has historically played a crucial role in catechesis. John Paul recognizes that sometimes memorization can lend itself to insufficient assimilation, “reducing all knowledge to formulas that are repeated without being properly understood.” (55) But he calls for a restoration of “a judicious balance between reflection and spontaneity, between dialogue and silence, between written work and memory work.” Just because something is memorized does not mean it should only be memorized. In fact, it certainly shouldn’t! A formula can be memorized to facilitate assimilation and deeper reflection. Being able to recall that “God made us to show forth His goodness and to share with us His everlasting happiness in heaven” allows one to reflect on that important fact at any time. This is certainly laudable! In our last post, we looked at the first section of Pope St. John Paul II’s post-synodal apostolic exhortation Catechesi Tradendae, On Catechesis in Our Time. Today we are continuing our closer look at this important exhortation from the Holy Father. The third section of the exhortation is entitled “Catechesis in the Church’s Pastoral and Missionary Activity,” and focuses a great deal on catechesis within the context of evangelization. As the readers of this blog will likely recall, St. John Paul II was a great proponent of the Church going into the world in the context of a New Evangelization — and he saw catechesis as a critical part of this. “Catechesis cannot be dissociated from the Church’s pastoral and missionary activity as a whole,” he wrote (18). Catechesis is not purely an end in itself. It is not an intellectual exercise, a memorization challenge. “The specific aim of catechesis is to develop, with God’s help, an as yet initial faith, and to advance in fullness and to nourish day by day the Christian life of the faithful, young and old.” (20) Nourishing the Christian life, growing in relationship with Jesus Christ — this is the aim of catechesis. We are all called to know and love God, and to serve him, and you truly come to love someone the more you get to know Him. In the Catholic Church, all ecclesial life centers around the Sacraments. This absolutely goes for catechesis, and this does not escape the notice of the pope writing in Catechesi Tradendae: “Catechesis is intrinsically linked with the whole of liturgical and sacramental activity, for it is in the sacraments, especially in the Eucharist, that Christ Jesus works in fullness for the transformation of human beings.” (23) Through catechesis we nourish the Christian life, the life which subsists in the Sacraments. We will continue our discussion of this important exhortation in the next post, with the fourth section. Joseph Pearce is an astoundingly prolific writer. A native of England, with a fascinating and moving conversion story of his own, he is a senior contributor at The Imaginative Conservative and senior editor at the Augustine Institute. His books include biographical works on C.S. Lewis, Shakespeare, Tolkien, Chesterton, Solzhenitsyn, and Belloc. He is a senior fellow at the Cardinal Newman Society and editor of its journal. Pearce also serves as series editor of the Ignatius Critical Editions. Recently, he penned a piece for the journal of the Cardinal Newman Society about this series and his involvement, entitled “Critical Editions You Can Trust.” With the permission of the author, we are happy to share the article here with our readers. Many years ago, when I was teaching a course on Romanticism at Ave Maria University in Florida, I was horrified to see the poisonous criticism that had seeped into the critical editions of Frankenstein and Wuthering Heights that I had assigned as set texts to my students. These editions were full of feminist criticism, so-called queer theory and anti-Christian propaganda. Why, I thought, should I put such poison into the hands and therefore the minds of my students? Why, furthermore, should I patronize such trash by assigning the texts in the first place? I felt responsible for increasing the sales of these iconoclastic editions, and felt responsible also for any uncleanness that might enter into the minds and hearts of my students through their reading of them. In response to this far from edifying situation, I suggested to Father Fessio of Ignatius Press that he should give me the go-ahead to become series editor of new editions of the classics. And so it was that the Ignatius Critical Editions were launched to provide a tradition-oriented alternative to the Norton Critical Editions and other similar series, which have succumbed to the radical relativism of postmodernism and its offshoots, such as the aforementioned feminist criticism and queer theory. These mainstream editions warp the original meaning of the great works through what can best be described as literary abuse. The Ignatius Critical Editions, by way of contrast, would respect the integrity of the works and the intentions of the authors, most of whom were devout Christians whose works reflect their living faith. A call for papers was sent out to hundreds of tradition-oriented academics across the United States, and indeed to Europe also, and many excellent essays were received. In 2008 the first three titles were published: Frankenstein, Wuthering Heights and King Lear. Over the following years many more titles followed. There are currently 27 titles in the series, ranging chronologically from Augustine’s Confessions and Boethius’ Consolation of Philosophy from the earliest years of Christendom to Bram Stoker’s Dracula, published at the end of the nineteenth century. Included among these 27 titles are seven of Shakespeare’s plays, providing a much-needed corrective to the egregious Shakespeare abuse which is currently rampant in the academy. My personal favorite of all the editions published thus far is the edition of The Merchant of Venice, published in 2009. Apart from my own introduction to the play and, of course, the full text of the play itself, newly annotated, the edition includes seven critical essays on various aspects of the play by some of the finest contemporary tradition-oriented scholars. Film critic James Bemis wrote about film adaptations of the play; Raimund Borgmeier, from the University of Giessen in Germany, wrote about the role of the family in the drama; British scholar Michael Brennan, from the University of Leeds, compared the functions in the plot of Venice and Belmont; Anthony Esolen, who will be no stranger to readers of the Journal, wrote of “the hazard of love”; James Hartley, a professor of economics at Mount Holyoke College, wrote about the problem of usury in the play, indicating Shakespeare’s evident sympathy with the Catholic Church’s position on the subject; Daniel Lowenstein, a professor of law at the University of California, Los Angeles, wrote on law and mercy in the trial scene. Other scholars wrote of ways of reading the play and of the role of friendship. How many different facets of this most difficult and misunderstood of plays were thus revealed within the pages of one solitary edition! Most of the titles in the series come with Study Guides which contain study questions and a selection of essay prompts. They also include a detachable answer key, so that educators can have guidance with respect to the grading of the questions and the essays, which would be especially useful for homeschooling parents. The most satisfying thing about my involvement with the Ignatius Critical Editions is the knowledge that no teacher at a Catholic school or college, or no homeschooling parent, need ever again find themselves in the position of putting into the hands of their students those editions of the classics which have been poisoned by the toxic mainstream. There is now a healthy choice and a tradition-oriented alternative. It can be quite a profound challenge to figure out the right way to teach sexual morality to teens today. There is even a debate as to the best age to teach it: while we want to avoid teaching it too early, and opening that can of worms before it is appropriate to do so, we also want to ensure that we (as parents and educators) are the ones who give them the right message and the correct information, rather than the dangerous misinformation they may get from peers or pop culture. This year, the Church commemorates the 50th anniversary of the release of Humanae Vitae, Pope Bl. Paul VI’s landmark encyclical on human life and sexuality. By far, most coverage of this encyclical focuses on the fact that, in this document, Bl. Paul VI affirmed the Church’s ancient and unbroken opposition to artificial methods of birth control — famously going against the final decision and recommendation of a committee he had set up to look into the issue. But the encyclical contains so much more than that — beautiful elucidations of Catholic teaching on human sexuality, love, living life in the vocation of marriage, and much more. Humanae Vitae has been a great gift to the Church. For the 25th anniversary of the encyclical’s release, 25 years ago, Ignatius Press produced a volume edited by Janet E. Smith called Why Humanae Vitae Was Right, featuring a number of essays on the encyclical by some of the finest minds in moral theology. This year, for the 50th anniversary, Dr. Smith has edited a new compendium of essays, entitled Why Humanae Vitae is Still Right, which Ignatius Press will be releasing this summer. Both of these volumes are invaluable resources for unpacking and understanding the encyclical itself, as well as the import it has down to today. Perhaps it is due to our fallen nature that the debate about sexual morality rages ever on, and western society continues to fight the natural, common-sensical, ancient understanding of the proper use of the sexual faculty. It seems as though things only get worse with each passing year. It is more important than ever to be able to impart the truth to our young people, so that they go out into the world properly equipped, and fortified by grace through the sacraments to fight temptation and sin. Another great resource for teens is the YDisciple video series components on chastity: “True Beauty: Chastity for Girls,” and “True Strength: Chastity for Guys.” Each of these is in four sessions, each session only a few minutes long. These videos are short and engaging, packing terrific information about the Church’s teaching on sexual morality. The YDisciple videos can be ordered from the Augustine Institute, and they are available on Formed.org. Of course, there are also the crucial reflections of Pope St. John Paul II, collectively known as the Theology of the Body. Reflections given at his general audiences over the course of several years, this catechesis on human sexuality and love is one of the greatest treasures the Church has given us, and is the fruit of a lifetime of reflection from this man, a great philosopher with incredible insights into God’s desires for human sexuality. There are many great resources on the Theology of the Body, but perhaps the best place to start would be the texts of the reflections themselves. It was recently announced that Paul VI will be canonized sometime in 2018, although the date has yet to be released. It will likely coincide either with the anniversary of the encyclical’s release, or possibly with the Synod on Young People, the Faith, and Vocational Discernment. Let us pray for the intercession of Bl. Paul VI, St. John Paul II, and St. Maria Goretti, that we are able to adequately impart to young people the beauty and truth of the true ends of human sexuality.